Le Quattro Volte, an idiosyncratic and amazing new film by Michelangelo Frammartino, is so full of surprises - nearly every shot contains a revelation, sneaky or overt, cosmic or mundane - that even to describe it is to risk giving something away... In four chapters - the movie's title can be translated as "The Four Times" - Mr. Frammartino successively chronicles the earthly transit and material transmutation of an old man, a young goat, a tree and a batch of charcoal. Each being or thing is examined with such care and wit that you become engrossed in the moment-to-moment flow of cinematic prose, only at the end grasping the epic scope and lyrical depth of what you have seen, which is more or less all of creation. - A O Scott, New York Times, 29 March 2011. Grave, beautiful, austerely comic, and casually metempsychotic, Michelangelo Frammartino;s Le Quattro Volte is one of the wiggiest nature documentaries - or almost-documentaries - ever made. Shown at the last New York Film Festival, the 42-year-old Frammartino's second movie is virtually without dialogue, yet filled with the sounds of the world and intensely communicative. Le Quattro Volte is at once casually mystical and doggedly materialist, visually sophisticated and knowingly archaic. It's a homespun Pythagorean meditation on the harmonious nature of the universe and the transmigration of souls shot in rural Calabria - the hilly land where, some 2,500 years ago, the Greek thinker invented mathematics and, according to tradition, preached to the animals. The movie's title translates to "The Four Times" but, not simply seasonal, it projects four states of being (human, animal, vegetable, and mineral). From dust to dust: Le Quattro Volte begins with a wheezing, grizzled old man and his herd of goats emerging out of the smoke rising from a charcoal kiln; the movie ends with the charcoal haze of what was once a mighty fir tree drifting across the screen. In between, the goatherd gathers up dust from the floor of the village church, which he mixes in water and drinks each night as a medicinal elixir. It evidently works - the morning after he misplaces his daily packet of church sweepings, he dies. 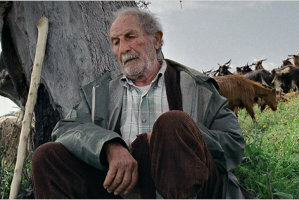 Crowd-pleasing as the dog's trick is, the following scene is no less striking: Looking, one imagines, for their bedridden herder, the goats have invaded the old man's house; in the movie's signature image, one stands inexplicably perched atop a wooden table, piteously bleating. Man has been displaced from the center of the world, but, if one follows the filmmaker's logic, his soul migrates first into a newborn kid (the birth scene rivals that of the baby camel's appearance in Sergei Dvortsevoy's Tulpan) and then, once the kid is separated from the herd and lost in the snowy forest, into the sheltering tree that becomes the movie's ultimate protagonist. The fir lives through the winter (a home to lichen and ants) only to be cut down and stripped of its bark in a mildly riotous, vaguely pagan spring ritual that involves the entire village. Inevitably, what can only be described as the tree's corpse is turned into charcoal - dust in the wind, some of which, also inevitably, will settle on the church's stone floor. I can see how, given its highfalutin premise, exquisitely shot recurring locations, and irresistible animal behavior, Le Quattro Volte could induce a nagging sense of calculated ethno-funk, but this skeptic found it pretty darn sublime. - J Hoberman, The Village Voice, 30 March 2011.